SOCHI, Russia (AP) In the aftermath to one of the most memorable victories in Germany’s long history of success, Toni Kroos and Marco Reus had a message for the critics back home waiting to see them fail. No, Germany didn’t make it easy. Nothing in this tournament has come easy for Die Mannschaft. 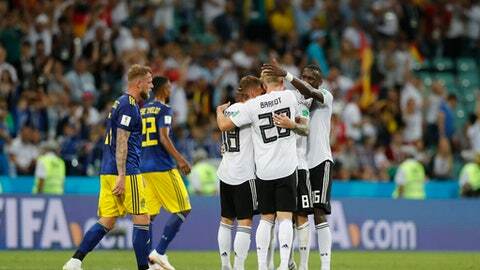 Yet the Germans sit with three points after Saturday’s 2-1 victory over Sweden and a chance to avoid what befell Italy and Spain, the previous two defending champions who failed to advance from the group stage. It’s all unexpected in a way. Germany’s lackluster opening performance and loss against Mexico was unexpected. Falling behind the Swedes 1-0 at halftime was unexpected. And certainly after going down to 10-men, Kroos’ curling strike in the fifth minute of stoppage time to secure Germany’s win was unexpected. After nearly a week of hearing what was wrong with German soccer following the loss to Mexico, the defending champions were on the verge of an even louder uproar. One moment, one strike changed it all. If Kroos’ shot was deflected, a little too high, or didn’t have the perfect whipping curl, Germany would be sitting with one point, needing a victory on its last group game and a lot of help to keep alive a streak of making the knockout round in every World Cup since 1938. But Kroos was perfect. The perfect pace. The perfect curl, the combo play with Reus catching Sweden by surprise just enough that defenders and goalkeeper Robin Olsen were unable to react. It was the latest goal ever scored by Germany in a World Cup match that didn’t go to extra time. It also created chaos in Group F. What seemed straight forward deep into stoppage time was turned upside down. Mexico, which has been among the more impressive teams in the tournament with two wins, could be eliminated if it doesn’t get at least a draw against Sweden. Even South Korea after two losses could still advance with a win over Germany and help from Mexico. The situation will create a lot of scoreboard watching on Wednesday when Mexico and Sweden play in Yekaterinburg and Germany and South Korea meet in Kazan. ”We have to put our foot on the gas and take our chances,” Kroos said. The lineup Germany coach Joachim Loew will use against South Korea will again be different. Loew made four changes to the lineup against Sweden, including benching Mesut Ozil for the first time in his senior team career in a major international tournament. The moves eventually seemed to pay off, especially the decision to insert Reus into the lineup and letting him attack from the midfield. There will be even more changes against South Korea. What’s already been a shaky defense will be without Jerome Boateng, who picked up a red card. Although, Loew is expecting Mats Hummels back after he missed the Sweden match with a neck injury. It was the combo of Hummels and Boateng that showed vulnerability against Mexico, and the pairing of Boateng and Antonio Ruediger was also unsteady against the Swedes. Germany could be without defensive midfielder Sebastian Rudy who broke his nose after taking an inadvertent foot to the face in the first half.